As mentioned earlier, the greater majority of my own learning’s on all matters Koi, including pond filtration, have come directly from the Koi breeders of Japan after numerous visits made over many years. There is no doubt at all in my mind that they produce the finest Koi in the world and continue to improve upon their quality with each passing year. 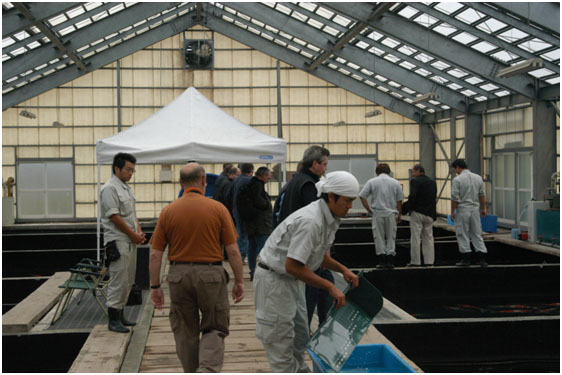 In early June the parent stocks are spawned and the fry are placed into outdoor man-made mud ponds named ‘doro-ike’ (dorro-ee-kay). There is nothing remotely ‘natural’ about these bodies of water apart from the minerals within the clay. These fry are fed daily as there is almost no natural food for them in these mud ponds. The breeder’s larger stocks have also been kept from the previous October in their indoor concrete systems at high stocking rates with a small amount of heat from oil-fired boilers in order to protect them from the bitterly cold outside air temperatures. Most of the larger Koi are fed sparingly although some are fed no food at all in the indoor ponds. For more than a decade, it is only the Koi spawned in the previous June (tosai) that are fed four times a day in water temperatures around 23C. Around mid-June all the larger Koi are released into other mud ponds to be fed and grown for around 90 days or so during the very hot summer months where increased growth and skin quality is significantly improved. Stocking rates are extremely low in relationship to the available water space. I have often heard this period referred to years ago as the ‘magic ninety days’ or the ‘golden ninety days’. 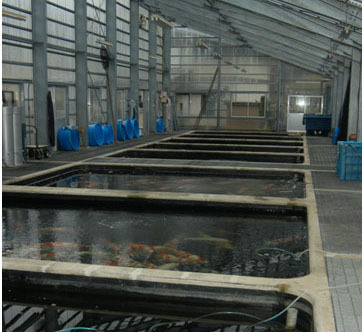 Once all other larger Koi have been released around mid-June, the indoor systems are emptied of water, all the walls and bases of the ponds are pressure-washed as is the media inside the filters and everything is left to dry completely through the summer. In this period they remain empty of water and are only re-filled and brought back to action in late September to prepare them for Koi soon to be harvested. So there we have a vast difference between our systems at home which need to be operated all-year round for year after year and the breeder’s ponds which are emptied and dry for some three months of the year. In late September every year, their systems are, once again, brand new! Please believe me, breeding high quality Koi is far from easy. 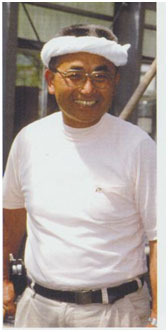 These Japanese breeders know all the difficulties involved and if there were any genuine innovations around to improve any single aspect of their daily work they would have incorporated it as soon as it became available. Since 1977 I have carefully observed all of the changes made and there have been many. 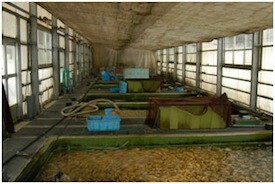 The first major change was the construction of indoor Koi houses rarely seen before. I hate to think of the thousands upon thousands of Koi that perished in outdoor water before these days. In later years oil-fired heating was added which made keeping techniques even easier. These breeders are far from being old-fashioned in their outlook and are not averse to experimenting with anything they consider to be possibly worthwhile. They have experimented with ozone and also trialled introduction of liquid oxygen together with the very important regulating controls required. They also have ready access to some of the finest Koi health laboratories in the world should internal surgery ever be required to some of their parent stocks or high value specimens. Their indoor ponds are always constructed by local specialist pond contractors and not by the breeders themselves who have very little practical knowledge in design, building and construction techniques. Their very own expertise comes from the breeding, feeding, culling, caring and the growing of their stocks. From breeders indoor systems I have seen in Japan each one is very similar to the next one and only varies on the actual shape of the ground space available. One thing is certain, these systems are all ‘simplicity itself’, and there are never any complex ‘add-ons’ at all. When an indoor Koi pond house is constructed the systems are always in-ground designs which are protected by a wooden or steel frame with polycarbonate/glass sides and roof to form a house above the ponds. The excavation by machine is also simple whereby the required depth of water and concrete base depth is simply excavated to form one complete flat concrete pad. The concrete ponds and filters are built onto this flat pad and the house itself is later built above pond water level. All the systems I have witnessed in build are all formed by wooden shuttering and concrete is poured to provide the walls. 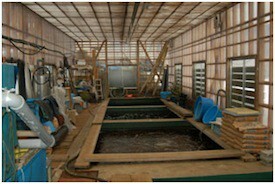 The filters are generally decked with timber or steel to allow good viewing of the Koi from above. Also, because the filters and ponds are built on the same flat base, if a pond is 2.5 metres deep then so are the filters. 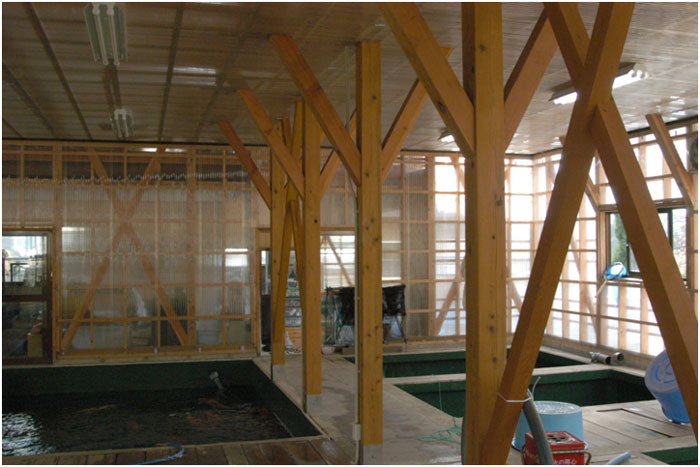 The concrete walls on this wooden indoor Koi house determine where the ponds and filters finish and the house above starts. The acute slope on the roof is there to assist the winter snows to slide off. This indoor house below is metal-framed, the water in the concrete ponds and filters reach the level seen and the house itself is built above that level. 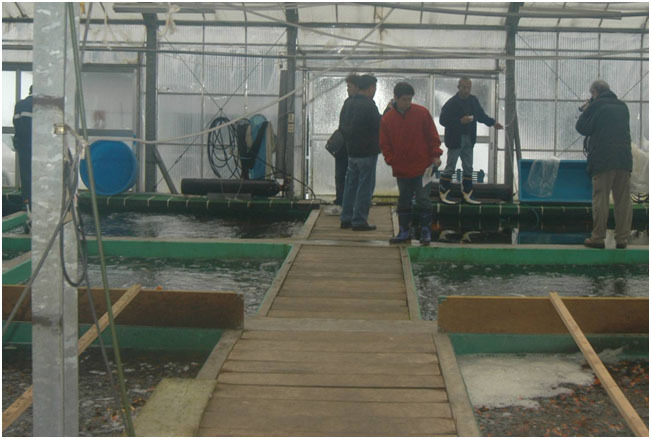 ‘Yozaimon’ (aka Yozen or Conias) Koi farm, Koguriyama village. 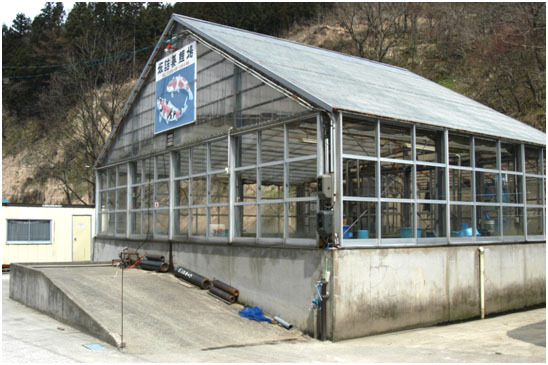 This huge steel and glass house built over the huge ponds which holds many Koi in true jumbo sizes has filters covered in removable steel access grids for periodic servicing. The filters below the grids can be easily seen bubbling away with very heavy aeration around the filter mat sheets. 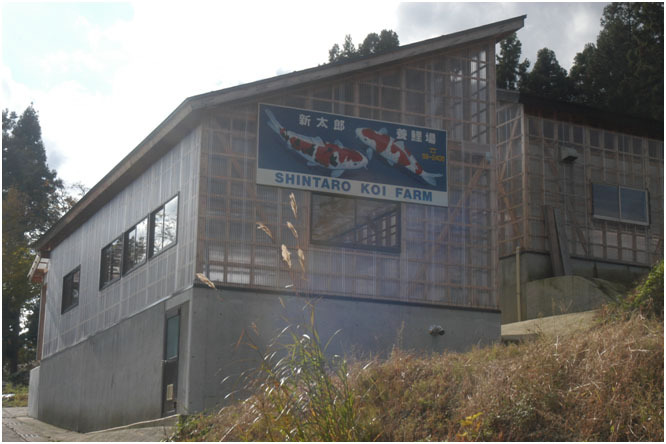 Izumiya Koi farm in Iwamagi village. 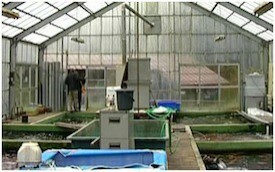 This is a typical layout of a breeder’s heated indoor system in Japan. The bottom drain covers are simply metal grids without domes or cover plates. Because these are indoor systems, there can not be larger solids such as leaves, twigs or any other outdoor debris entering the water. The drain sumps are connected in 4” (110mm) tube to the discharge box as seen top left. Bottom drain tubes and 4” (110mm) filter chamber drain tubes are all taken into the empty discharge box. The 4” (110mm) outlet from the discharge box is connected to the nearest sewer line as shown. Long standpipes inside the box stop all these five outlets and the breeder religiously discharges all these outlets on a daily basis. This takes any faeces and much of the heavier ammonia produced directly to waste. It is as important and as ‘automatic’ as is cleaning one’s teeth each morning to the breeders. The first stage of the filter is supplied gravity water by way of the pond wall feed also shown. This is usually built around the base of the vertical pond wall in 6” (150mm) tube and the face of the outlet is protected by a grid to prevent accidental damage to the Koi. 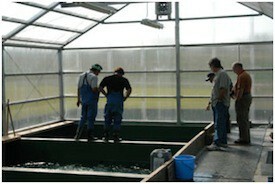 I have intentionally not shown transfer methods between chamber to chamber as they do vary from breeder to breeder. 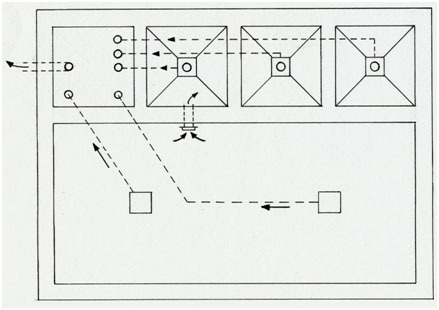 Some use simple direct open connections mainly for settling purposes whilst others use upward-flow methods described before. I have often seen horizontal canals used in smaller systems. 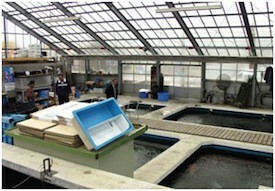 Choices of media used range from vast amounts of whole oyster shell to aerated filter mat cartridges. I have even seen large chunks of sharp stone employed. 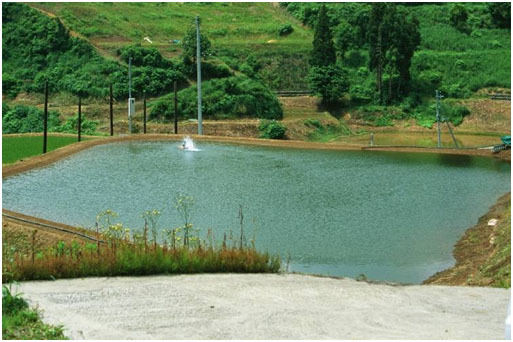 In every instance the ponds and filters are very heavily-aerated either by air pump or by water pump. 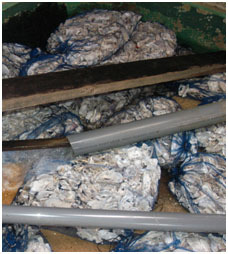 Whole oyster shell media in sacks, commonly seen in the filtration chambers. 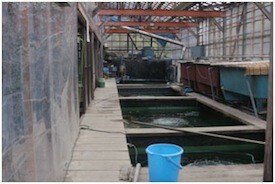 One only has to walk it to these farms to witness the indoor ponds and techniques that are in use from early October until the following June. Once again, I must point out that these systems are only in use for nine months a year after which they are completely cleaned out and left to dry throughout the summer. 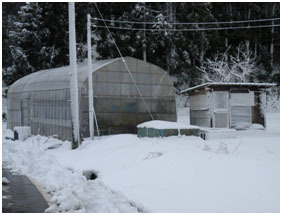 This picture on the right is taken near to Teradomari town and shows a ‘polytunnel’ Koi house. Although this area near the coast is not subjected to the high snowfalls seen in the Yamakoshi Mountains, it still depicts snow and very low temperatures. The breeders still have to add heat to these ponds. The above pictures are just a random cross-section of some important indoor Koi houses that can be readily-seen upon visiting the area. 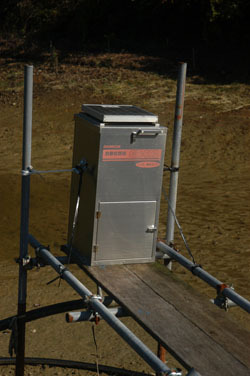 All these show filtration chambers positioned in gravity-fed applications and these are covered by removable decking in timber or metal to serve also as space-saving access walkways. I assure you that there are no ‘add-ons or gizmos’ used in any of these systems apart from significant aeration and everything within the houses is on permanent, open view for all to see as these houses are rarely locked. You will NEVER see pump-fed filtration; enclosed pressurised units or any sign at all of moving-bed filtration principles here, despite very heavy stocking rates, please bear this in mind when considering your own Koi pond filtration today. ‘Pure Simplicity’ forms the filtration methods employed here by all the breeders I know and these are the aspects I am trying to pass on to readers by way of these texts. One thing however, is very easily apparent and Mother Nature provides this by way of ample daylight. 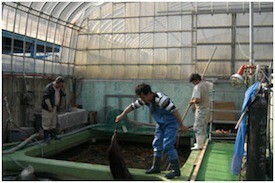 Without this incredibly vital commodity, keeping Koi successfully in an indoor situation is just about impossible. Properties of natural daylight provides the moss-like algae forming on pond walls and bases which contains essential vitamins & minerals for the Koi that can not possibly be replicated in any man-made Koi foods. Over the years I have visited many ponds owned by Japanese Koi enthusiasts and these are in operation all-year round just like ours. 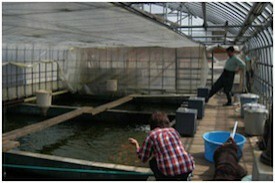 They are not only operated for nine months a year as are the breeder’s ponds covered above. Generally speaking, the Japanese private pond systems are not nearly so refined in comparison to some of the ones we can see today in other parts of the world.